Followers of the Spiritual Director Adoration Ministry, Enugu, Nigeria (AMEN), Reverend Fr. Ejike Mbaka, have raised the alarm over an alleged plot to assassinate him. This is coming as the outspoken Catholic priest apologised to the vice presidential candidate of the Peoples Democratic Party (PDP), Mr. Peter Obi, during his Friday midnight ministration at the adoration ground. According to a statement by Mbaka’s followers made available to Sunday Sun, some unknown gunmen fired gunshots at him on his way along Emene road, Enugu, on Thursday. The statement tagged ‘Alarm over assassination plot and threat to Fr Mbaka’s life’ was signed by the President, National Adoration Family, Chief Aka Emmanuel; President, Adoration Fathers’ Associations World Wide, Chief Okolo Godwin; President, Adoration Mothers’ Association World Wide, Mrs Ann Aligwe; President, Adoration Youths’ Association World Wide, Chukwu Agoziem; and Media Chief, Mr. Ike Maximus Ugwuoke. The statement reads: “It is with rude shock and utter surprise that we received the report of the attempted assassination plot of the Spiritual Director of Adoration Ministry Enugu Nigeria last Thursday evening by some unknown gunmen who fired gunshots at him on his way along New Artisan road, Independence Layout, Enugu. “This assassination plot against Fr. Mbaka is coming barely few days after the 2018 Harvest and Bazaar of the Ministry whereat Fr. Mbaka had come under massive media attack for asking Peter Obi, the PDP vice presidential candidate for the 2019 general election who attended the bazaar programme, to make public his support or donation for the church project of the Ministry. “Many supporters of Peter Obi and even clerics have misconstrued this as embarrassing to Obi and to the Catholic Church and this has consequently given rise to the statement issued by the Catholic Bishops Conference of Nigeria (CBCN) that same Thursday on the issue. The issue had lingered in spite of the apology, which Fr. Mbaka in his characteristic humility, had tendered at the altar to Obi and anyone who may have been in any way, form and kind offended at the bazaar event. Meanwhile, Mbaka had last Friday issued an open and unreserved apology to Obi while also urging his followers to sheathe their sword and end the ongoing social media war that was sparked by events of last Sunday. He said: “Some of you may be expecting me to write something and put it online or join the attacking or defensive group. It’s not my job. I don’t have time to waste. I am not even a priest of social media. It may surprise you to hear that I don’t even have a personal Facebook account. “So all these I am hearing I don’t even know about them. Meanwhile, on behalf of myself, Rev. Fr. 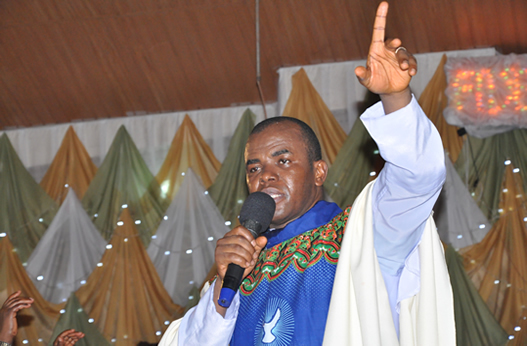 Mbaka Ejike, the servant and the spiritual director of this Adoration Ministry, Enugu Nigeria, I wish to apologise humbly to the former governor of Anambra State, Mr. Peter Obi, who came here on Sunday for bazaar, if in anyway, shape or form my utterances or actions induced, initiated or prompted derogatory remarks, criticisms, unhealthy attack to his personality. “I didn’t intend any of these. All I said on that day I never meant to insult him or to bring his political career down. My intention was simply to support the work of God. If my actions exhibited misdemeanor or any unhealthy attitude that provoked even himself and those who love him that brought about all these verbal attacks, I am asking whoever is orwasormaybehurtto please forgive me. Any time Mbaka ridiculed himself through his ungodly/unethical political gimmicks he will cry out of an assassination attempt, in 2015 I was in CKC adoration ground live when Mbaka entered the adoration ground around 10pm-11pm and informed us that the assassination team were waiting for him in the road leading to the front gate and he out-smarted them by following the back door but those men were truly men of the Nigeria Army which Jonathan in his wisdom placed there to guild him after his 1st January 2015 prophesy/abracadabra in order to protect him from being killed by his political enemy to tarnish his name. Now again he is crying of an assassination attempt, “by who?”. Buhari’s team, Atiku’s team or Catholic Church?. Mbaka, the holy spirit of God is like a dove so he can fly, be wise so that he will not flew away from you if he has ever being your friend and companion.